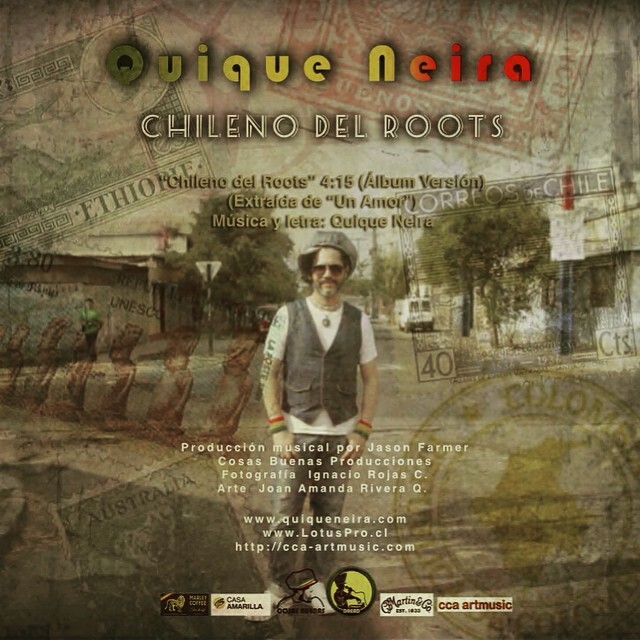 Quique Neira has over twenty years of a career linked to reggae and this is precisely the inspiration behind this new single ‘Chileno del Roots’, the second single from his album “Un Amor” (October 2014). The clip of ‘Chilean Roots’ was directed by Atilio Zenteno and Ignacio Rojas, using newest art technology, including a HD drone. The video clip also has the special participation of the artist’s nephew, Jonas. 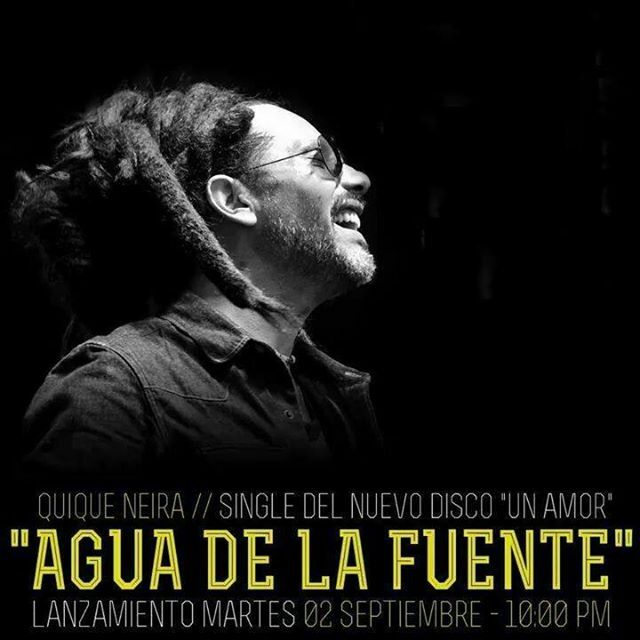 Quique Neira lleva más de veinte años de una carrera ligada al reggae y esa es precisamente la inspiración tras este nuevo single ‘Chileno del Roots’. El tema es el segundo sencillo de su obra “Un Amor” de 2014 y viene a suceder ‘Agua de la Fuente’. El clip de ‘Chileno del Roots’ fue dirigido por Atilio Zenteno e Ignacio Rojas. Se utilizó tecnología de última generación, incluyendo un dron HD, y se filmó en distintos lugares de Chile: la playa de Cartagena, el Teatro Municipal de San Fernando y las calles de San Ramón, donde Quique pasó su infancia. Esto se completa con grabaciones en presentaciones hechas en distintas ciudades del país, incluido su paso por la version 2015 del festival Siempre Vivo Reggae. El Video Clip cuenta ademas con la participación especial del sobrino del artista, Jonás. Quique Neira describe la composición como “mi historia hecha canción”. Y agrega que “al mismo tiempo, es la historia de muchas personas que al igual que yo debieron sortear muchas dificultades y desafíos para poder materializar sus metas”. 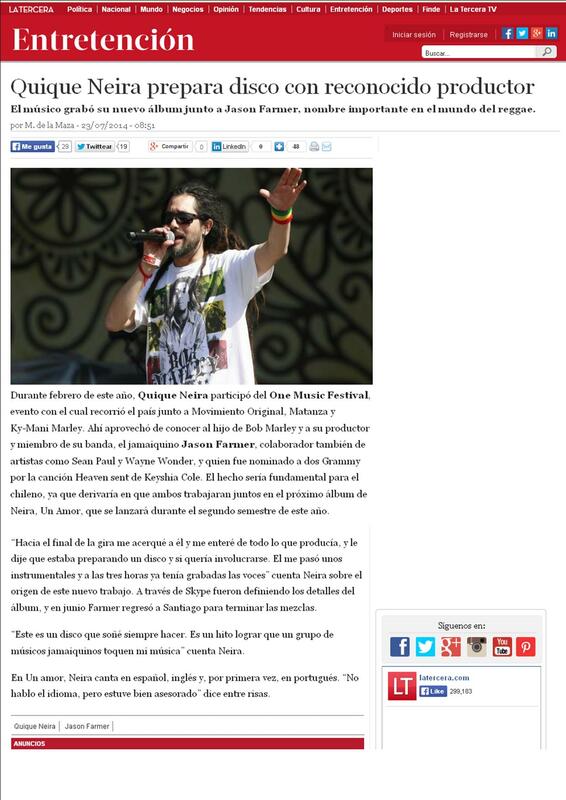 On October 22, 2014 he released his latest album “Un Amor” (One Love). 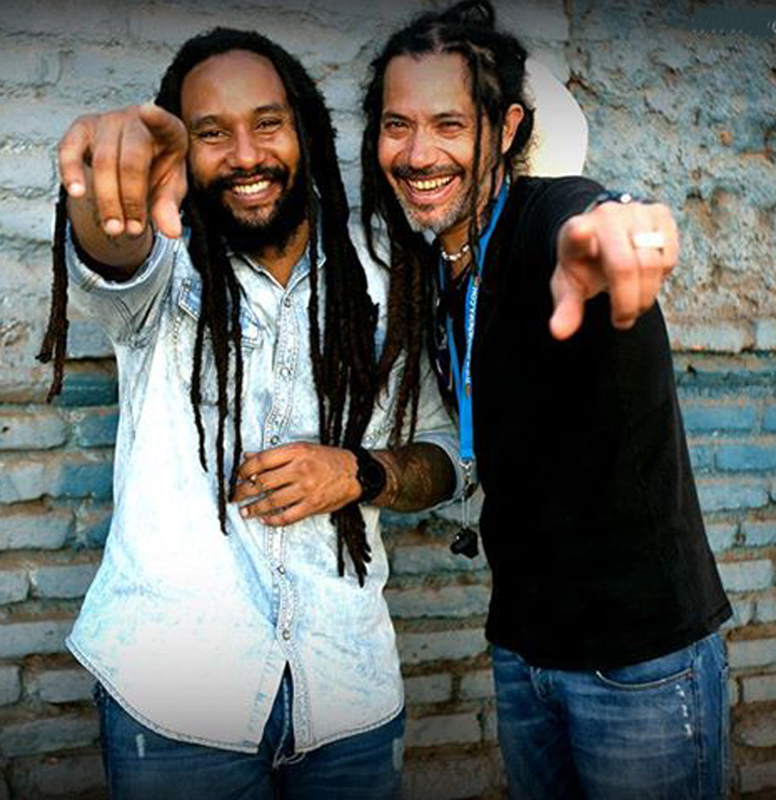 The album features Reggae artistes such as Kymani Marley, son of Bob Marley and Dread Mar I of Argentina, another of the great Reggae musicians in Latin America. “Un Amor” is the first album in his career which includes songs done in three languages: Spanish, Portuguese and English.The album was produced by Jamaican producer, Jason “J-Vibe” Farmer, who has produced several work that has received Grammy nominations for internationally renowned artistes such as Sean Paul, Estelle and the Third World band. In fact, this is his first album that has not been produced by him. For Quique the album “Un Amor” represents more than just fulfilling a goal and a dream. Track #1 “No Me Rendiré” deserves its place as the opening track on the album, and represents a good first impression for any great Reggae musician. 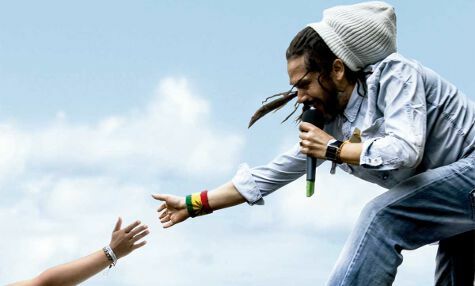 Track #2 “Live Another Day” which features Kymani Marley is the first song that he has ever done with a son of Marley. The track is an hypnotic fusion of Rock and Reggae with elements of Dancehall. It is also the only song which has a combination of lyrics in Spanish and English. Track #7 “Solamente Tu” is the only exclusive Dancehall song on the album. Track #8 “Cada Cosa En Su Momento” has the nostalgic feel of sweet Rub-A Dub music of the early 1980’s. it is the first song that was written for this album. If you are a fan of Sugar Minott then you are bound to enjoy listening to this theme. Track #13 “Patient Love” which is the English version of the opening track “No Me Rendiré” is the only song that is performed exclusively in English, It perfectly captures the element of Jamaican Lover Rock. For some people it speaks to his love for Reggae music and his yearning to have his music played on the airwaves of the land where Reggae was born. This might very well be the song which gives him his debut into the Jamaican market. 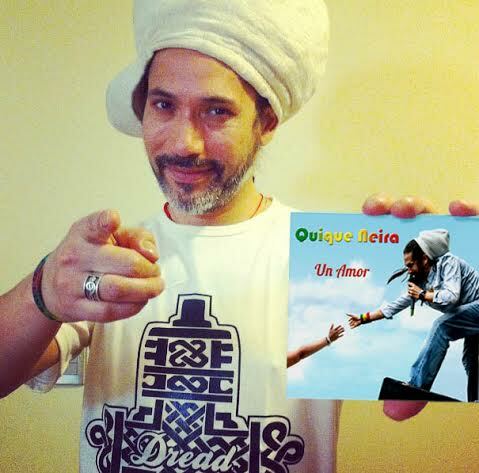 Base on the quality of the music which was produced on this album, we expect that “Un Amor” will become one of the greatest Reggae albums from Latin America. It s truly a classIc wIth every song on the album worth listening. Posted on December 31, 2014 in Album "Un Amor"